Nú mun Fuzzy kollurinn bera þetta merki Bændasamtaka Íslands. Íslenskt sauðfé er alið á sjálfbæran hátt í óspjallaðri náttúru og lömbin sem fæðast á vorin reika sjálfala á fjöllum yfir sumarið, drekka móðurmjólk og éta næringarríkan fjallagróður. Þetta skilar sérlega hollu kjöti sem er rómað fyrir bragðgæði. Lagskipt ullin af íslenska fénu fyrirfinnst hvergi annars staðar og lopaklæði og gærur hafa haldið hita á þjóðinni í óblíðri íslenskri veðráttu í meira en þúsund ár. Stofninn kom til landsins með landnámsmönnum og er óspilltur og einstakur. Bændur eru vörslumenn landsins og búa enn á fjölskyldubúum eins og forfeður þeirra en hafa tileinkað sér það besta úr nútíma tækni og vísindum. Féð er alið á vistvænan hátt undir ströngustu reglum um dýravelferð, án aðskotaefna, erfðabreytts fóðurs eða hormónagjafar. Íslenskt sauðfé er nátengt landinu, menningu þjóðarinnar, siðum og tungumáli og lambakjöt er sannarlega þjóðarréttur Íslendinga. Aðeins ekta íslenskar afurðir bera þetta upprunamerki sem endurspeglar þennan sannleik og gildi íslenskra sauðfjárbænda. Icelandic sheep is raised sustainably in unspoiled nature and the lambs, which are born in the spring, roam free in the mountains during the summer, drink milk and eat nutritious mountain vegetation as they have done since 874. This provides a particularly healthy meat that is renowned for its flavor. The layered wool of the Icelandic sheep is not found anywhere else in the world and the lopi wool garments and tanned have kept the people warm in the harsh Icelandic weather for more than a thousand years. The Icelandic sheep arrived with the settlers and they are pristine and unique. Farmers are the custodians of the land and still live on family farms like their ancestors, but have adopted the best of modern farming science and technology. The Icelandic sheep is reared in an environmentally sound way under the world’s strictest rules on animal welfare, without contaminants, GM feed or hormone administration. 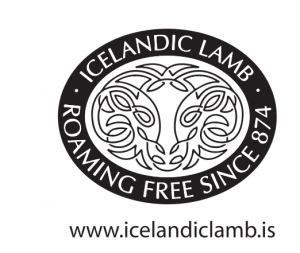 Icelandic sheep is closely linked to the country’s culture, customs and language and lamb is truly Iceland´s national dish. Only genuine Icelandic products bare this sign of authenticity that reflects these truths and the values of the Icelandic sheep farmers Association.